Are Laminate Cabinets Inferior to Wood? For one reason or another, laminate kitchen cabinets have gotten a bad reputation—but are laminate cabinets really inferior to wood cabinets? The answer is a clear no. In actuality, laminate cabinets can prove to be a better choice than wood to install in your new kitchen. 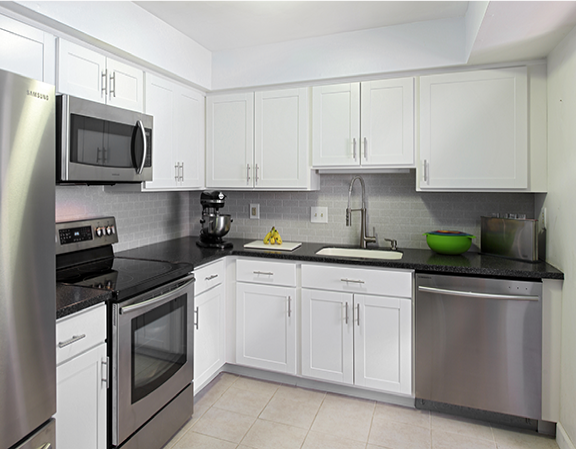 Today’s blog will give you all you need to know about laminate cabinets. Laminate cabinets are created using a thin film of material that is bonded to the exterior surfaces of the cabinet door, while the cabinet interior remains composed of less expensive or pressed wood materials. There are different types of laminate that can be used to create laminate cabinets, and these include resin-impregnated, vinyl films and hot-stamped transfer foils. Because laminate cabinet doors can be easily installed onto wooden cabinet frames, they are the perfect candidates for cabinet refacing. Laminate cabinets come in a variety of types, and the type used really depends upon the kitchen craftsman’s preferences. The most common laminate cabinets are made from pressed hard plastic, but you can also install wood laminates, which use thin sheets of wood to give the look of high quality wooden cabinets. Types of laminate cabinets also range in durability and price. Low-pressure laminates may have a propensity to chip and crack, depending on the quality of construction materials used, but are less expensive. High-pressure laminates are a great choice for kitchen cabinets, but can be on the pricy side. So why should you choose laminate cabinets for your kitchen remodel or cabinetry refacing? Laminate cabinets are easier to clean than wood, they offer more durability over time and tend to conceal fewer scratches than solid wood cabinets and cabinet doors. There once was a time when there weren’t many options when it came to designing kitchen cabinetry. But now, laminate cabinets come in a variety of colors, textures and finishes. They are even available in faux wood grain finishes to give your cabinets a true solid-wood feel. They will last you a lifetime, and can be easily painted, stained or re-finished.